I went to Vegas! I had a Tim with me! It was a long drive! I was really excited! I still am, can you tell?!!?! Anyway. 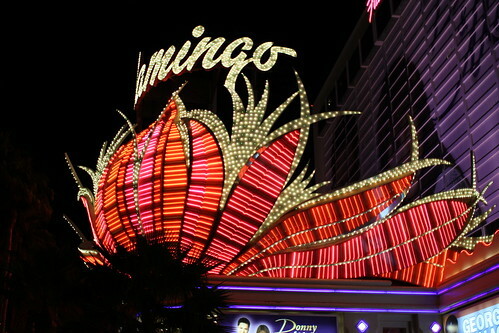 It was my first time in the city of sin, and dudes, I can’t wait to go back. I shot a ton of video of shiny things, which you all will see in due time (i.e. whenever I get a chance to edit it). 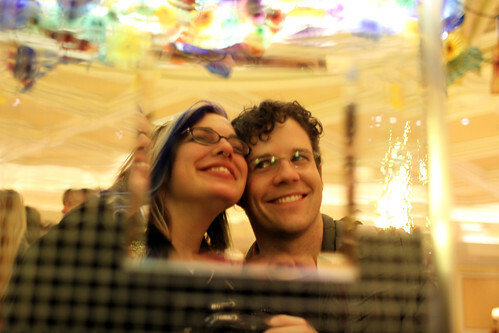 Oh bellagio lobby! How I wish your beautiful flower sculpture wasn’t ruined by horrible Christmas decorations (not pictured). Although, the Christmas stuff wasn’t all bad- this is us in the reflection of a giant Christmas present that was decorated to look like a disco ball! 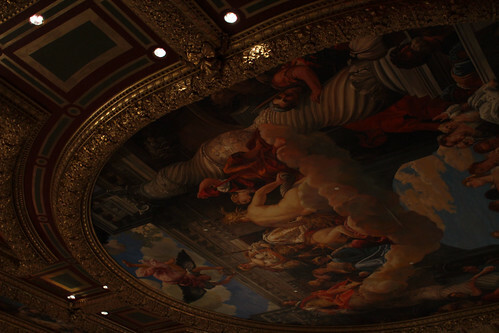 We stayed at the Venetian, and honestly, I can’t think of any reason I would ever stay anywhere else. 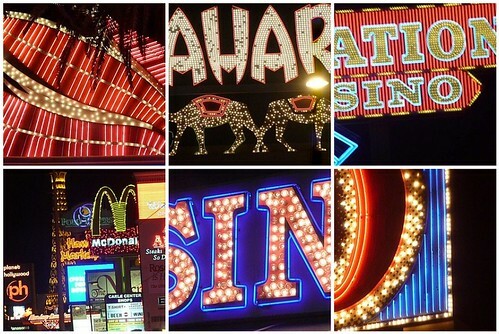 The entire place was filled with murals and gold leaf, without an overload of lights and bad carpeting- the trademark tackiness present in most of Vegas. 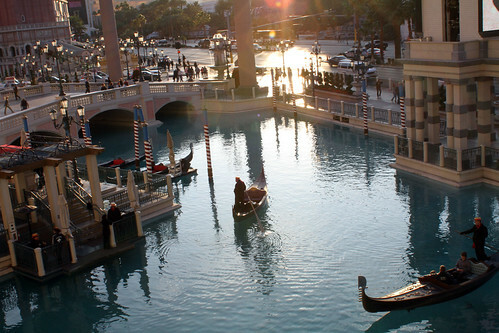 I mean, there are gondoliers, people. Who doesn’t like gondoliers?!? 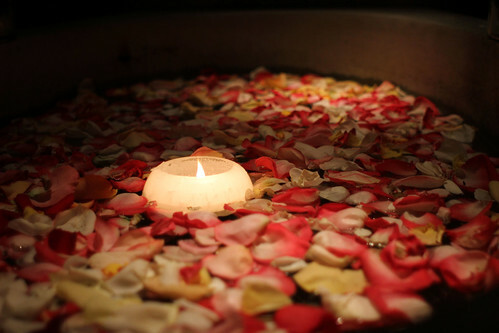 They also had a restaurants with bathtubs full of rose petals with candles. Sadly, you aren’t allowed to get in them. This, my friends, is a TRAVESTY. Also at the Venetian was Madame Tussard’s wax museum, where you’re allowed to touch and photograph the figures pretty much any way you like. 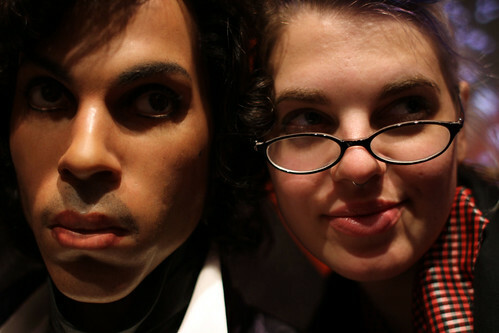 Prince & I are BFF, in case you were wondering. 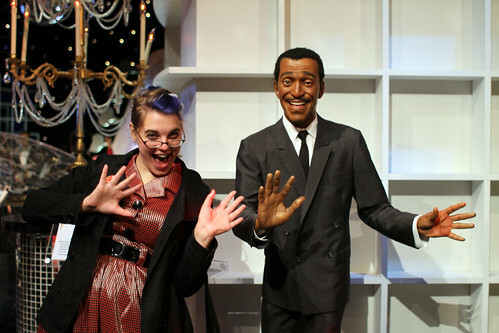 Sammy Davis Jr. is also a close pal. That said, Liberace and I go back pretty far, and clearly he is my best homeboy at Madame’s place. 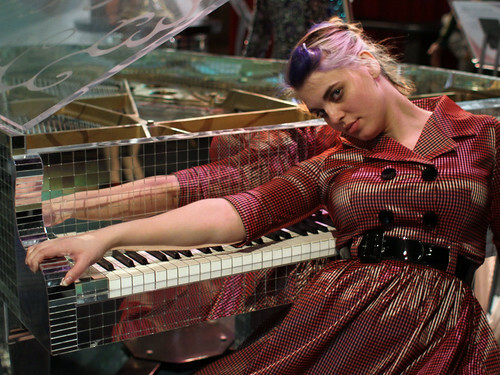 He even let me molest his disco piano– that’s how tight we are. 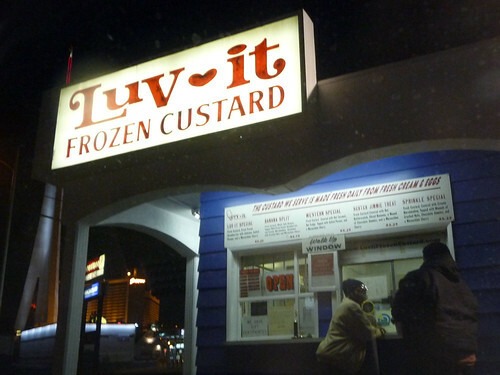 Before we left, we went and got the best frozen custard on the planet at Luv-it custard. You know what her name is? Queen! Model! Goddess! You know what your name is?!? LUCKY MAN! I got to admit, I’m an alcoholic, but I get hungry too. Help me out? We ended up giving him a couple bucks, and he made us bow our heads as he said a prayer for our safe travel home. & travel safely we did, despite a 10 hour drive and SNOW for a whole section of mid-California. hmm, flowers look like chihuly, or? 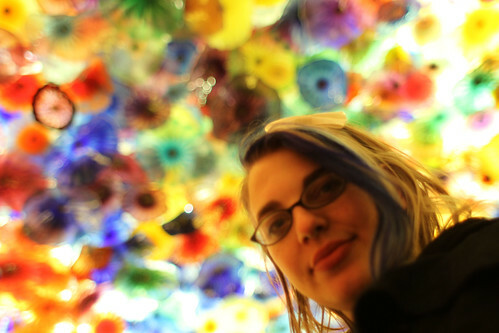 They are, in fact, Chihuly. 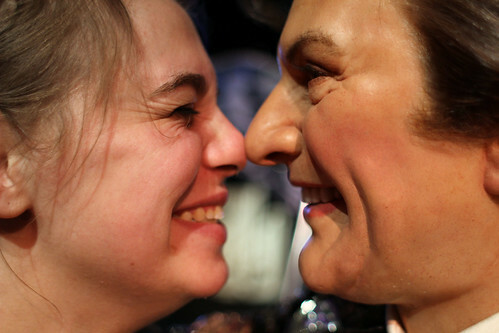 The photos of you and the wax figures are totally priceless. We need an all-girl’s weekend in Vegas!!! awesome pics! looks like a great time. Oh man! I’ve only been as far as the Vegas airport (WORLD TRAVELER HERE, WHAAAT.. Okay, I was on my way to LA), but I plan on going there in 2012? You musta had a blast! I also love the way you’re so casuallyadorableyou in all your pics. Something about that makes me wanna give you a high-five. 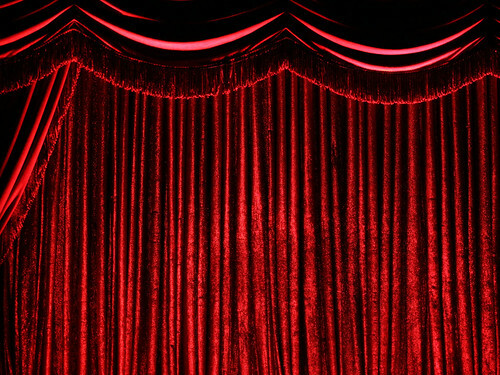 Where did you get that amazing red-belted dress?! I love it! It looks so great on you! wow! @nubby- yes. girls vegas trip is clearly in order. @Allie- My next post will be about that dress & where it came from.